The Competition aims to support the development of original, innovative, environmentalist and economical school architecture designs and the implementation of innovative ideas for the Field Schools planned to be constructed in various countries. As a consulting member of the United Nations Economic and Social Council (ECOSOC) and committed to supporting sustainable development, ’’Kimse Yok Mu” Solidarity and Aid Association shall build within 5 years many Field Schools, that will provide basic education and deliver them to the national education institutions of Africa. Our SCHOOL wants to be an small but super efficient building. Using a ‘spiral’ two story strategy we are able to provide the 100 sqm and the 200 sqm in a footprint which is 30% less than if we develop it in one floor. This reduce significantly the cost of material and the ecological impact being a flexible, affordable and energy efficient device. In addition, we are able to give a protected up space and an open air step for the community. The green roof is the better option for isolation and also good for growing food. Only one existing tree and earth is required to build his project. The tree is the element that build the courtyard and the community, the earth becomes the construction material used as compress stabilized earth blocks. To storage water is also a big priority introducing different tanks for rain water and waste water. To be self-efficient in terms of energy is the last worried. We introduce solar panels and batteries to provide electricity for the scholar use. 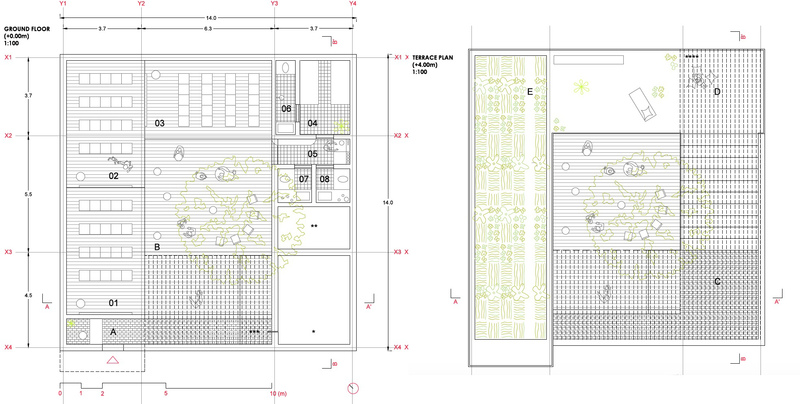 FLEXIBILITY – The ‘L’ shape around the courtyard facilitates the different uses of the space. Moveable furniture gives the possibility of divide the spaces according to the requirements. COMMUNITY – The open air steps give accessibility to the terrace and acts as a community space for also for the people of the surroundings. FARMING – In the terrace we found a farming area where produce food for daily meal of the children.